Shell has signed a $6bn (£3.12bn) deal with the Middle Eastern sheikhdom of Qatar to supply liquid natural gas (LNG) to North America and Europe. 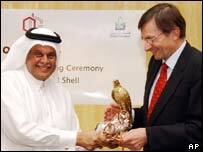 The UK-Dutch group will own 30% of the project, with Qatar's state oil firm owning the rest. The agreement is the latest in a string of deals reached by Qatar, which is trying to make itself a regional leader in natural gas. US oil giant ExxonMobil signed up for a $12.8bn deal earlier on Sunday. France's Total is expected to join the ExxonMobil scheme, dubbed Qatargas-2, on Monday, taking 5 million tonnes of LNG a year. ExxonMobil will be taking some 15 million tonnes each year for 25 years from the end of 2007 under the deal. Shell's agreement, under the name Qatargas-4, foresees the building of new facilities to handle 1.4 billion cubic feet of gas, and 7.8 million tonnes of LNG each year from 2011 onwards.